Theo designed the Tsarskoye Selo Egg to celebrate the establishment of this most beautiful of architectural and domestic creations ’ the Tsars’ Village, just outside St Petersburg. As we approach the year 2010 we prepare to celebrate the tercentenary of the foundation of this imperial idyll just outside the former Russian capital. 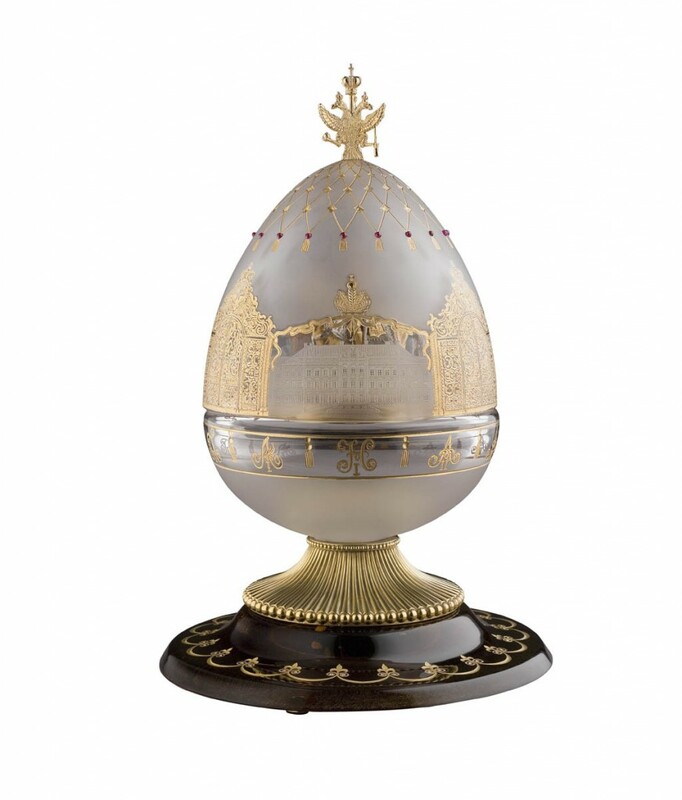 The crystal Egg is mouth-blown and hand-engraved with images of the Royal Russian family at the principal palaces in Tsarskoye Selo. To the front, Tsar Nicholas II is pictured with the Tsarina Alexandra in front of the Alexander Palace. The five children of the last Tsar and Tsarina are shown playing snowball in front of the Little Hermitage in the gardens of Catherine’s Palace. The final cartouche is that of Catherine’s Palace itself. Three glorious palace gates are ornamented to include the subtle differentiation of pedestal and ornament created by the original architects and craftsmen in wrought-iron. The superb hand-engraving continues in ornamental tassels enamelled with 24-carat gold, descending from the finial of a triple-headed eagle fashioned in gold and silver. Engraved to the girdle of the Egg, the monograms of all the Tsars who lived in Tsarskoye Selo. The fluted gold and silver base is set on a foot mouth-blown in fine crystal and fashioned to resemble lapis lazuli. 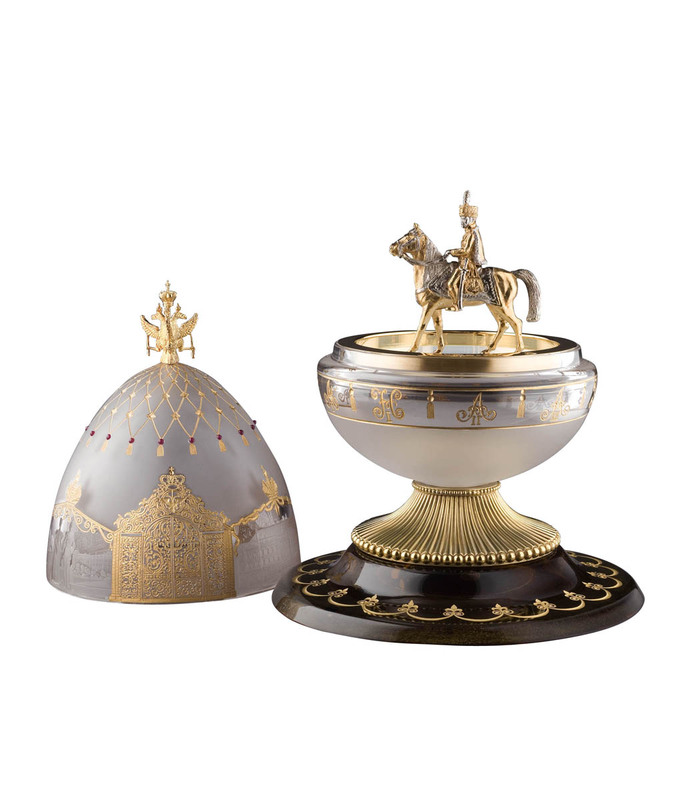 In the tradition of the Fabergé family, open the Egg to reveal the surprise; Tsar Nicholas II last Emperor of all the Russias, on horseback. Nicholas is modelled in gold and silver after an oil-painting whose original was acquired by the friends of St Petersburg Collection and returned to Alexander Palace a decade ago. 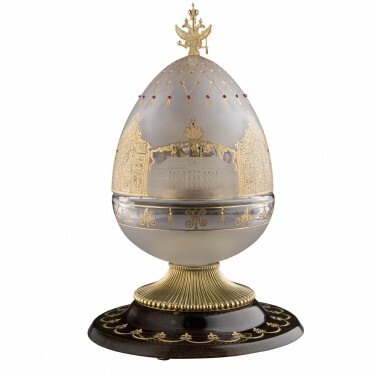 The Tsarskoye Selo Egg will raise funds for the restoration of the Tsars’ Village and in particular of Alexander Palace. 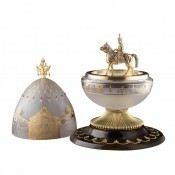 Theo Fabergé’s creation is an enduring tribute to the magnificent Romanov Village and to the culture, which created it. 300 years after the foundation of Tsarskoye Selo, this echo of history and culture is expressed in timeless style, and rendered by Theo Fabergé whose illustrious grandfather Carl held the warrant for the Imperial Court and created the most fabulous objets d’art and jewellery in the history of the civilised world.